Cóitheach - a sudden gust of wind, which comes out of nowhere, particularly noted along the cliffs. 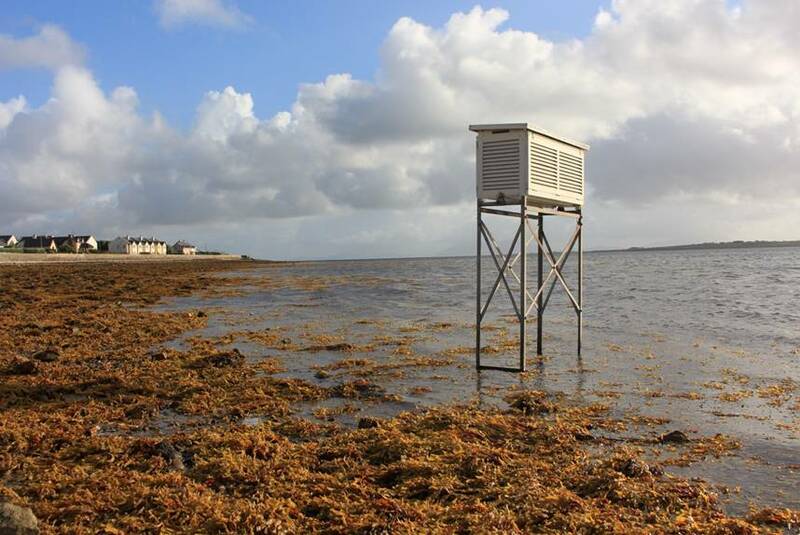 Noah Rose and Selma Makelaís project looks at maritime and meteorological knowledge local to the area of North Erris, focusing on the particularly descriptive detail that exists in words in the Erris-Irish dialect relating to the sea and weather. The artists have worked primarily with sound, researching with Irish-language scholars, fishermen, historians and meteorologists. 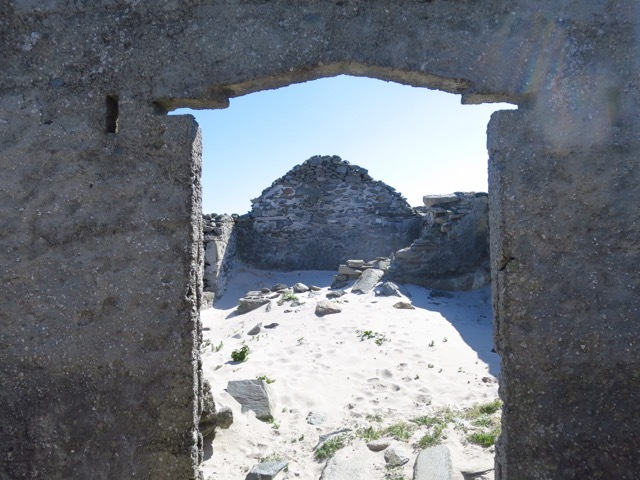 They have combined these with their own field recordings from across the Mullet peninsula, offshore islands and under the sea, and created temporary sculptural sound-installations layering Erris-Irish words with English translations, mixed with sounds of the natural environment. These have been installed at various locations in and around Belmullet. In an era of increasing dependence on new technologies in navigation, fishing and meteorology, the artists consider our increasing detachment from the natural environment. With these changes the vocabularies expressing a human connection with the natural environment are also changing, with words falling into disuse.The artists also worked with children from Belmullet National School, with a small ceremony at Belmullet Pier in which they become ëKeepers of the Weather-Wordsí - to look after and pass them on to the next generation. In an era of rapid climate and environmental change, the artists question what we are we leaving behind for the next and future generations. Noah Rose works across disciplines, often in public space, exploring the ways that memory and sense of identity locate to place and define cultural context. His practice explores the fine-grained, often intangible detail that shape cultural, linguistic, socio-political and other communities of interest. Drawing on sculpture, design and craft, he has developed cross-disciplinary working models which employ a range of material approaches. Major public art commissions include: ‘Third Bridge’ Derry (2005), ‘Observatory’ Burnley (2010), and ’The Museum of Interconnected Events’ as part of 2014’s ‘Changing Tracks’ public art programme in County Mayo, Catalunya and Northamptonshire. Solo exhibitions include: Leitrim Sculpture Centre (2016) and Áras Inis Gluaire, Belmullet (2017). Recent selected exhibitions include: ‘Claremorris Open’ 2017, ’Contrafogos’ touring Brasil, Uruguay and Argentina (2017), ‘Strict’ Girona (2015). Site-specific collaborative work in Denmark for the Opening Ceremony of Aarhus 2017 European Capital of Culture. Selma Makela’s practice references meteorological and geological phenomena as a means to explore the complexity of memory, migration and displacement. Her work explores the transitory and fleeting nature of a human timescale seen against the backdrop of the vastness of geological time lines. She has been the recipient of awards from The Model, Sligo (2017), Leitrim Sculpture Centre (2017), The Arts Council (2012), Galway County Council (2017), Fogo Island Arts, Newfoundland (2011), Fleck Fellowship from Banff Centre, Canada (2010). Recent solo exhibitions include: The Focus Room at the Model, Sligo (2017), Galway Arts Centre (2014), Oonagh Young gallery, Dublin (2010), PEER gallery London (2008 & 2012). Public art commissions include ‘Blown In’ Headford, Pilot Project for Galway2020 (2016). Selected group exhibitions include: A.P.T. London (2017), Barbican, London (2016), RWA, Bristol (2016), Claremorris Open (2007-13, 2016), Centre Culturel Irlandais, Paris (2015), Void, Derry (2015), RUA, Belfast (2013). Children, parents & teachers of Belmullet National School. Brendan Murray, Ian McAndrew, Tony Conway and all the staff of Áras Inis Gluaire.